Whether you need to monitor the pipeline right-of-ways, inspect well sites, or manage many other oil and gas assets efficiently, our drone-based solutions deliver a flexible, cost-effective way to inspect your oil and gas assets. Traditional methods of inspecting oil and gas assets are dangerous and time-intensive. Teams of roustabouts, engineers, and EHS professionals drive from asset to asset, or walk pipelines, and take notes on a clipboard or mobile device. While helicopters move inspection to the air, they introduce additional safety risks and lack the agility to navigate complex assets and dangerous terrain. Now, using drones, you can get better data, faster. There’s no need to own a drone, maintain a pilot on staff, or analyze data. We’ve built our service based on years of operations research and work for Fortune 100 clients. As a result, you can procure enterprise-grade aerial intelligence—featuring easy-to-understand action items and takeaways—through a simple, turnkey service. Credentialed pilots, with experience flying oil and gas projects, deploy an array of visual and advanced sensors to collect data over the assets. Reports identify potential issues and where they are on your property. When data is collected over time, the resulting operational insights can enable long-term asset management. Don’t just collect data—get insights. Use our intuitive reporting services to resolve issues or integrate data into asset management and enterprise resource management systems. According to the Center for Disease Control, from 2003 to 2013, the number of work-related fatalities in the oil and gas extraction industry increased 27.6%, with a total of 1,189 deaths, and more than 50% of persons fatally injured were employed by companies that service wells. Flying drones reduces the amount of time well tenders spend in the immediate proximity of well pads and other equipment. By removing the necessity of manual inspections, oil and gas companies can use well technicians to focus on either higher value-added inspections or maintenance alone. The real economic benefit, then, isn’t in a 22% cost reduction or an increase in the number of well pads you can inspect in a day—it’s in having those technicians available to focus on uptime and drive or maintain overall revenue. Using drones for inspecting oil and gas assets results in higher quality, more consistent, and faster data collection. Helicopter pilots can attempt to fly the same altitude and route over a pipeline or well pad, but a drone can be preprogrammed to run the exact same navigation points and route at the exact same height. Route and height are key to collecting consistent imagery. Not only that, but drones collect structured data that can be aggregated with a larger structured data set and then transmitted directly via API to a work-management system. Data is not only collected more quickly but in a manner that skips manual touches and potential data integrity loss. Through our partnerships with SAS, CapGemini and SalesForce we can provide further analytic firepower, leveraging their analytics, yours, or our own in-house services. We even work with consulting firms such as Deloitte and McKinsey on behalf of clients. 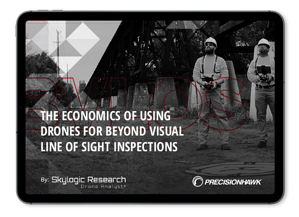 The foundation of an effective drone strategy is knowing when to use traditional, VLOS, and BVLOS inspection approaches. More than 15,000 licensed operators are available to fly any site in the United States within 24 to 72 hours. It’s not a PDF or a pile of photos. We offer a web interface with a report you can integrate into your asset management systems. We help you select the best sensor for the job, and understand the unique needs of oil and gas companies. Want to further integrate drones into your preventive maintenance and incident recovery programs? We offer a full suite of services that strengthen the data value chain. The result: You can manage your infrastructure efficiently and effectively. "We think [PrecisionHawk's recent acquisitions] position the firm as a leading service provider for companies wanting to perform asset inspections—specifically those companies in the oil & gas, insurance, and utility industries that need BVLOS operations." Whether you are looking to improve uptime, save money on time-consuming field operations or protect the safety of your workers, we provide a flexible, compliant and cost-effective approach.